The animal kingdom is a bit different from what we humans are used to. For humans, color is meant to inspire a few different moods. Bright, warm colors inspire passion and particularly active emotions. Red and orange gets the blood running, whether communicating a dangerous boss in our favorite game, the warning flare of a stop sign, or the suggestive hope of a Valentine’s card. Blues and greens make us think calmer thoughts, pleasant ones. Then those are those peculiar violets and opalescent colors that provoke thoughts of mystery. The wilds, though, tell a few different stories. Bright and vivid colors pretty much collectively say, “I’m poisonous and will probably kill you.” It’s not exactly the passion that mankind is thinking of when they head out for a stroll wearing their favorite red shirt, right!? Color and flair, otherwise, is usually pretty restricted to the males, which is a fairly odd switch from the way mankind manages its fashion. Perhaps the most colorful creature we think of is the peacock. Brilliant blues, greens, and, of course, the still mysterious purples flare on their tail feathers, all to attract the completely boring brown ladies. Fortunately, we humans can take a little of both worlds and put it to the best possible blend of each. 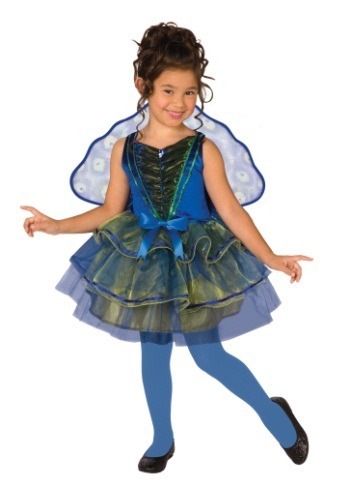 Such is the case in this adorable Child Peacock costume, capable of being worn by any of your kids, even if they are girls! Tell those silly peacocks that we can do what we want with our own colors! Your tyke will look beautiful in this pullover tutu dress with blue velour and green metallic sequins. The full skirt shows a variety of lovely colors and a series of quarter circles of mesh knit over wire frame makes up the blue and white spectacle tail feathers. Show the animal who is the colorful boss and watch as your little one is the talk of the season.